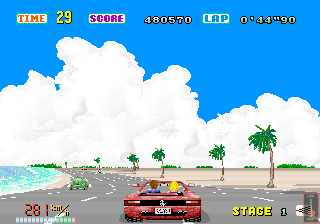 Ah, Out Run. Anyone who was a gamer in the eighties and early nineties can’t ever forget it. It wasn’t just that it was technically impressive — and it was, for the time. 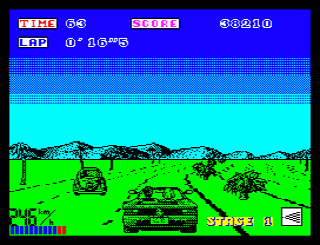 The main appeal of Out Run was that it wasn’t a typical “racing” game in which professional drivers run against each other in specially prepared tracks or sections, such as a Formula 1 or rally race. Out Run was different: it was about a guy trying to impress a girl in his Ferrari Testarossa, through several North American scenarios. It wasn’t a “race”, there were no “opponents”; the other cars on the road were just normal traffic. Even advertisements at the time, instead of talking about some “ultimate driving challenge”, just said that you’d almost be able to feel the wind in your hair. In short, it was a very different driving game, and there’s a reason people still remember it well.